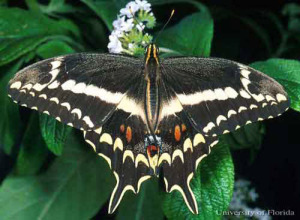 The Schaus swallowtail butterfly, Heraclides aristodemus ponceanus, is an endangered species of butterfly in Florida with critically low numbers. Habitat loss is an important component in its decline, but exotic species are having a detrimental effect. .